St Jude’s church has a peal of eight bells in the key of F#, which range in weight from 456kg (4cwt-0qr-18lb) treble to 735kg (14cwt-1qr-25lb) tenor. The bells are hung on a wheel for full-circle or change ringing, a style developed in England around the 17th century, and are maintained by the bellringers of St Jude’s. The bellringers of St Jude’s are part of the Australian and New Zealand Association on Bellringers (ANZAB www.anzab.org.au). We ring the bells on Sunday morning from 09:00 to 09:30 – calling people to worship – with practice on Tuesdays from 18:45 to 20:00. The bells are also rung, when requested, for weddings and for special occasions and/or important celebrations and events. Below is a picture of the band of St Jude’s in 2017. The first peal of bells was installed in St Jude’s church in 1872. 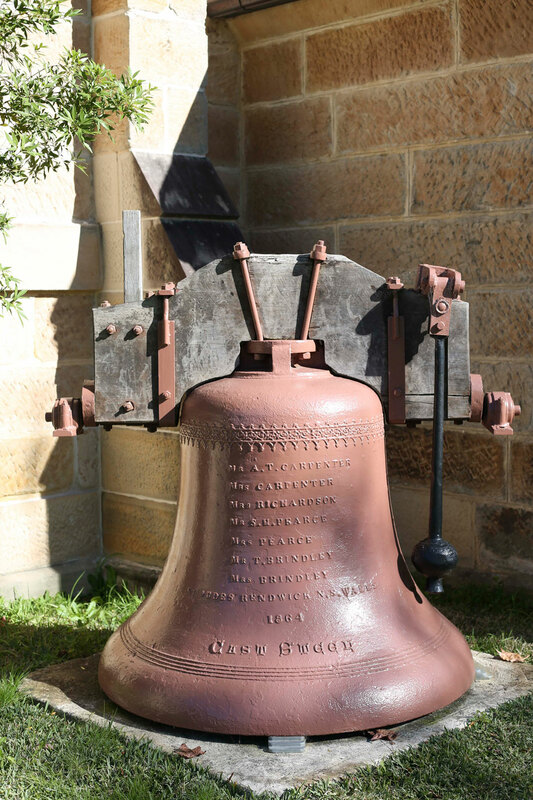 These bells were made of steel and over the decades rusted so much that they became unringable and were replaced in 2000 by bronze bells purchased with a Bicentennial grant and through generous gifts made by parishioners and others. The smaller set of six of the original bells have been rehung at the Russian Monastery of the Holy Transfiguration in Bombala, southern NSW. The two larger bells can be seen next to the northern entrance to the church. How does change ringing work? 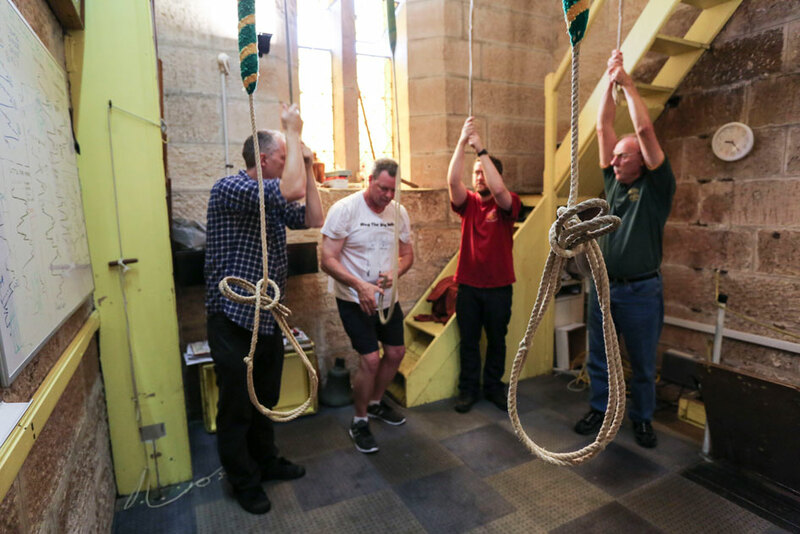 General information about bellringing (“campanology”) can be found on various places on the internet, including The Adelaide Bellringers website and on the ANZAB website. A video of the St Jude’s band ringing for service ringing is below. Curious observers or those interested in learning to ring are always welcome on Tuesday practice nights, and contact can be made via the Church office. It takes from 6-10 weeks (~30 mins-1 hour per week) to learn to handle a bell safely and after that ringing with other ringers is possible. Ringers come from all backgrounds and are of all ages (although we don’t recommend starting before age 11). Ringing is a form of gentle exercise and requires mental agility rather than physical strength. Change or full-circle ringing is a skill and past-time practised widely in Great Britain, Australia and New Zealand and to a lesser extent in Canada and the USA. Being a ringer enables new friendships to be made in the above countries and ringers are always made welcome at any tower with bells.